About six months ago, I wrote several posts (see below) about the differences between small business vs. scalable entprepreneurship and the implications for an educational curriculum. Silicon Valley, for the most part, is geared towards scalable startups (i.e. the companies that seek to be the next Google). As a result, programs in entrepreneurship offered by Stanford, UC-Berkeley, etc. tend to be oriented towards entrepreneurs with the big ideas. But what about entrepreneurs with more modest ambitions? While organizations like SCORE have long sponsored clinics for small business people, there doesn't seem to be the same effort geared towards educating small business entrepreneurs. Yet, it's a well publicized fact that 45.6% of people employed in the U.S. work for companies with less than 100 people and that these firms make up 99.6% of U.S. companies. It is also a well known fact that the rate of small business failure is high. And while I don't have hard facts to support it, based on what I've seen working with small business people, it is my hypothesis that much of this failure could be prevented by educating small business entrepreneurs in the tools and concepts they need to make better decisions. Since I wrote this post, I've had the good fortune to become connected with educators and business people who feel the same way. I've been part of an advisory group working with West Valley College in Saratoga, CA. Under the leadership of Heidi Diamond, Dept. 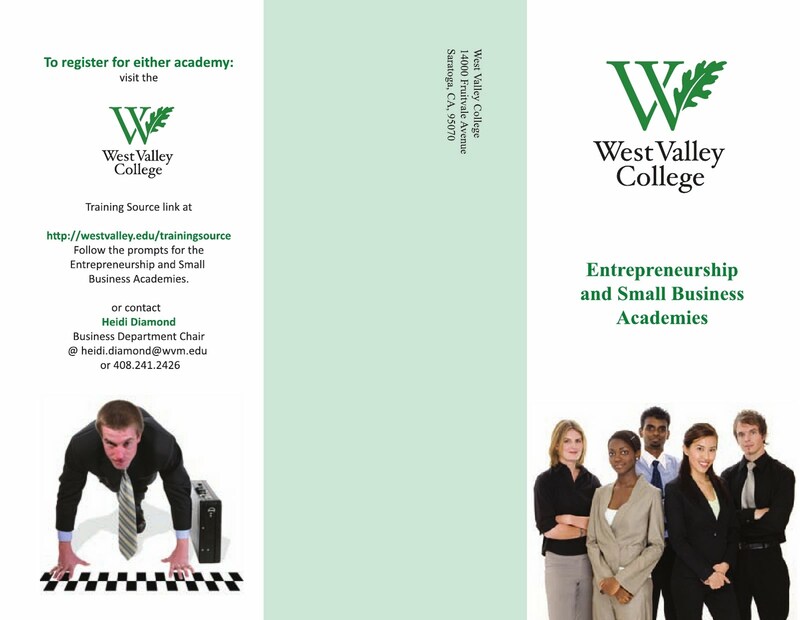 Chair for Business Administration and Real Estate, West Valley has created two new offerings in entrepreneurial education geared towards the needs of the small business entrepreneur. 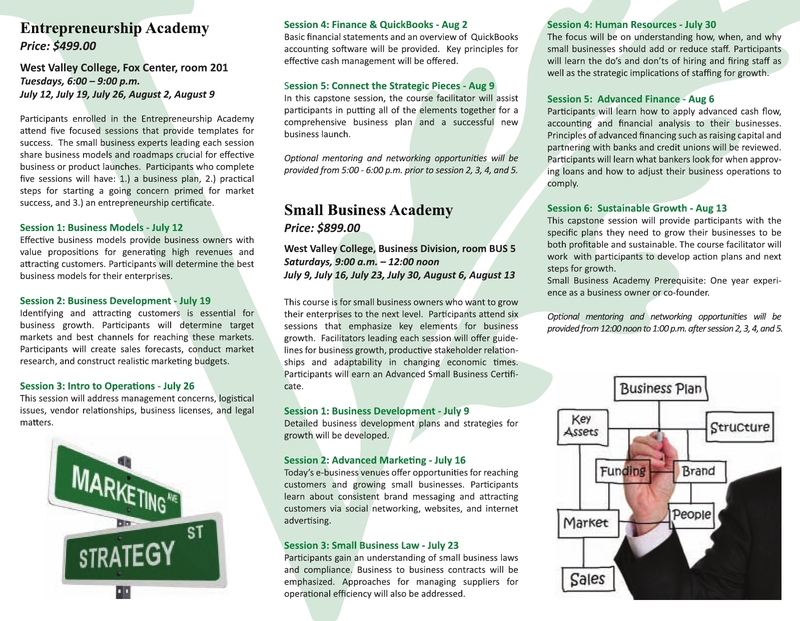 The first, called the Entrepreneurship Academy starts July 12 and is directed towards budding small business entrepreneurs. 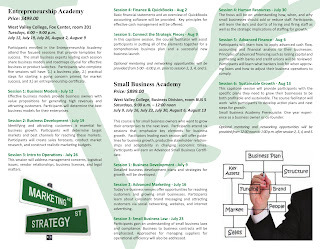 The second, called the Small Business Academy starts July 9 and is geared towards more experienced small business people who have gotten their businesses off the ground but are looking for the knowledge to take their ventures to the next level. For those of you who may be interested or know someone who may be interested, I encourage you to check it out. You can link to the West Valley College course website on either of the two links above or by going to http://westvalley.edu/trainingsource/. How to prioritize the critical from the "nice-to-haves"
Saying "no" has the obvious benefit of cutting down the "to do" list. But it took me awhile to get over the guilt of turning down requests, especially where they represented future opportunities. Ultimately sleep deprivation taught me that the consequences of saying yes all the time were more painful than saying no in most cases. Good enough comes from recognizing that in many cases, especially in project management and business development, getting something out there, even if it wasn't perfect was better than getting nothing out there because it wasn't perfect. This is tough on perfectionists (of which I am not). This trait is probably why I'm a pretty good general manager, business development person, and troubleshooter, and was at best a mediocre engineer, would starve as a designer, and is a good thing for society that I'm not a surgeon. Important and urgent tasks: Do them. But first ask, am I the only person who can do these (by virtue of my position or special skills) or can they be done by someone else (even if I can do them better)? If the former: do them. If the latter: train and delegate! Urgent but unimportant tasks: See step 2 above. These are usually candidates for delegation or outsourcing. Unimportant and not urgent tasks: I.e. time wasters. Will playing Angry Birds for the 12th time really change my life? Of course deciding what is important depends on knowing what your goals are. But even with this framework, there are times when the task load ramps to the point where clearing through category 1 tasks takes all my time. So be it; such is life. Hows that for rationalizing why my blogging has been erratic lately? "DirtPud.Ding, a ground-breaking, mobile, digital media, clean-tech, social networking app developer seeks a world-class, ROCK STAR software developer. Must have a proven track record developing high profile, killer iPhone applications, be a team player, pro-active self-starter, and willing to work for equity only. Candidates should have worked in a startup that successfully exited to Google and know Mark Andreesen on a first name basis." Sound familiar? Just another Silicon Valley job posting by some startup seeking an "A-player" for peanuts. After all, it's a given that for a startup to succeed, everyone you hire must be an "A-player," right? Get the team right and everything just flows! Now don't get me wrong, there is nothing wrong with trying to hire "A-players." One should try to hire the best talent possible. But how realistic is it to expect that you will be able to hire WORLD CLASS, ROCK STAR talent for all of your positions when you' haven't even reached Ramen-profitability and your office is the local Starbucks? What if you can't? If your expectation is that you MUST have all "A-players" to succeed, your startup will fail. Is Rhodes Scholar smart with state-of-the-art working expertise in their professional field whether that be software programming, sales, or accounting. Has sufficient experience to apply those skills, identify and anticipate issues, troubleshoot ambiguous situations, creatively problem solve, and guide the startup in the proper direction. Is a team player, one who can fit their activities into those of others, subordinate their own interests as needed for the common good, and still has great interpersonal skills at 3:00 am in the morning. Is self-managing, setting priorities in line with overall company goals, disciplined enough to keep their tasks on track, coordinates them with others, communicates well, and makes minimal demands on management attention. Has a can do, positive attitude uplifting to their team mates. Is ethical, of outstanding person character, and free of excessive ego. Has the dedication and energy to put in the extra hours and effort required, when the startup needs it (which is pretty much 24/7). In short, an "A-player" is the model human being (let alone employee). The fact of the matter is that these people are (a) very scarce and (b) in incredibly high demand. Economics 101 tells you that this means that even if you can find them, they are likely to be gainfully employed as someone else's highly compensated employee or making a living (i.e. they charge) as a very well paid independent. The other fact of the matter is that most of us fall short in one or more of the areas listed above; we're NOT Charlie Sheen (as he perceives himself to be) but Mere Mortals. So at the risk of offending someone, this means that most likely, most of the people working in your startup are Mere Mortals and not "A-Players." This does not mean that you can't have an "A-Team." An "A-Team" is more than just a collection of "A-players." 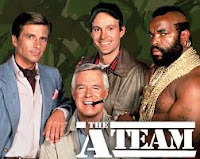 An "A-Team" is one that blends the strengths of all its members, both "A-players" and Mere Mortals, in such a way that overall team strength is maximized and weaknesses mitigated resulting in high performance. Characteristics of an "A-Team" are focused direction, a high level of work quality and quantity, high energy and esprit de corps, an almost intuitive level of communication between team members, creativity, confidence, and an optimistic approach to challenges. The recruiting pool is deeper - The simple fact is there are more Mere Mortals available. This does not necessarily make recruiting any easier (see below). But recruiting now becomes an issue of determining fit vs. being an issue of pure availability. The business is more robust and more scalable - A business that depends on the unique skill sets of just it's "A-Players" is more vulnerable and harder to scale than one based on a team. "A-players" thrive too - If you create an environment where Mere Mortals can thrive, its likely to be friendly to "A-players" too. So with these advantages, why do so many entrepreneurs focus on "A-players" instead of an "A-Team?" Belief that "A-players" don't need to be managed or led - In my experience, in any team with >2 people (some would say >1) this is false. There is no such thing as perfect coordination without some management. Belief that people come "hard wired" - This is the belief that one either is or is not an "A-player." In reality, management studies show that performance is often context specific. It has been my experience that people can change and be trained; why else do we have teachers and mentors? Because they should - Part of the job of being CEO is recruiting key talent. You do need "A-players." You just don't want to build your business on the basis that everyone has to be one; your business will come to a grinding halt when you can't fill the positions you need. How to Create an "A-Team"
So let's say that you want to create an "A-Team." While there is no formula for this and a lot depends on the skill of the management team and group as a whole (after all we are dealing with messy, quirky, people who don't behave logically), one of the best books written on the subject is Hidden Value: How Great Companies Achieve Extraordinary Results with Ordinary People , by Charles O'Reilly and Jeffrey Pfeffer. Here are some practices common to all "A-Teams." Hire A-players for key, value proposition critical positions; hire Mere-Mortals elsewhere - This means that you must have a good understanding of what your business's key value propositions are and what are the key resources needed to deliver them. 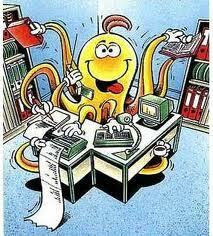 For example,you may not require a Rock Star in accouting...unless you are an accounting firm. Hire for fit - Fit to what? Values and culture. Which means you have to know what your values are. Values should tell people what priorities are important to the company, how the company will treat people, how decisions are made, what the company stands for and what lines the company won't cross. High performance teams take time to build which means you have to hire for commitment. Share knowledge - Information is the lifeblood of an "A-Team." If you want to engage your employees' brains, both "A-players" and Mere Mortals, they must have access to detailed information about what the company is doing and attempting to accomplish. Team based systems and rewards - To foster collaboration, knowledge sharing, and build esprit de corps, rewards should be based on whether the entire team wins or not. Training - "A-Teams" invest in improving the capabilities of all their members. Particularly in a rapidly changing environment, it is important to provide the training needed to keep employees current. By all means, seek to hire "A-players" but build your business on the back of an "A-Team."